Greenhouses were once unheard of in the area but thanks to the FFB they are now extending the availability of fresh vegetables and creating significant health benefits. The Hushe area is almost never green - the people living here can obtain vegetables only in the summer season. Lack of fresh vegetables leads to more disease. 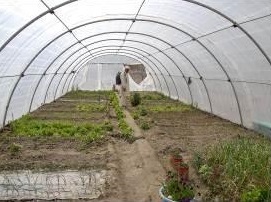 To provide more vegetables for the population, the FFB introduced the concept of green houses. We established two of them, one in Machulo and another in Saling. Two farmers were instructed in their use and how to propagate seeds and they have now gone on to give training to more of the local people enabling them to build their own greenhouses. This project has been highly successful; many people have now built their own domestic greenhouses giving their families access to fresh vegetables throughout much of the year.